"Well, Hello NAMM!" The Anaheim Convention Centre, 2015. That aside though...MUSIC. Obviously that's what we actually went there for. 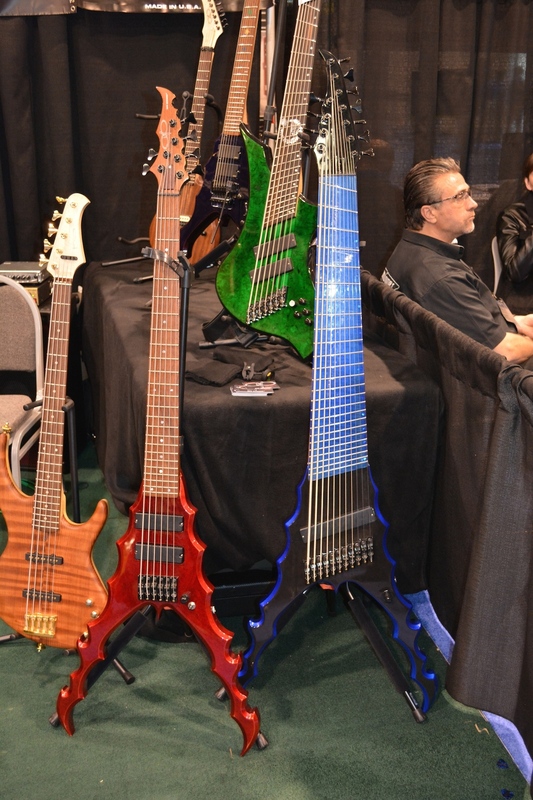 And as usual, NAMM was nothing short of impressive. Highlights included some serious rocking out at the Wood Violins booth (no, really), a hi-tech new gadget by the name of “REVPAD”, and of course the entire ESP Guitars room. No one puts on quite a display like the ESP custom shop. A little more about the REVPAD, just because we thought it was #dope. I think the general consensus was that this new little gadget completely blew the Ibanez Kaoss-pad-equipped-guitar out of the water (the Ibanez guitar was released last year at NAMM, and honestly, it seemed pretty cool at the time). It’s essentially everything that Ibanez wanted to achieve and more. The REVPAD is small, inconspicuous, intuitive and easy-to-control; you can link a huge array of guitar pedals and effects to it; and to top it off, you can still connect a Kaoss pad (wirelessly, of course) if you really want to. Basically, it's an amazing remote-control, but without the unsightly custom-made guitar that has a massive chunk cut out of it where the Kaoss pad sits. That’s just silly and impractical. Anyway, I’m not here to advertise it (I should have probably demanded sponsorship for this…). Have a look at it for yourself. Brad and Jeff of Drumsmack TV, NAMM 2015. We also bumped into the guys of Drumsmack TV, a bunch of super nice and funny dudes. If you’re a drum aficionado (and even if not), you should definitely check out their weekly show sometime. They interview some of the best drummers in the business, opening up a whole new scope of music appreciation. Tré Cool being très cool, NAMM 2015. And while on the topic of drums, Mr Tré Cool of Green Day also made an appearance, patiently ploughing through an autograph session that lasted an hour or five. Seriously, I don’t know how some of these guys do it. It was hot, loud and busy, and there he is, smiling, on his feet for several hours, in a suit. Hats off to you, sir. A special mention is definitely required for Mr Paul Reed Smith, the very man behind PRS Guitars (and one of only a few people with the ability to turn Frank into an over-excited fangurl). Also, a shout-out to Emil Werstler (Chimaira, Dååth), awesome guitarist and demonstrator at the PRS booth; oh, and Ronnie Radke (Escape The Fate; Falling In Reverse), just because I like his bands. Don’t hate on my emo side. Unfortunately, we did miss out on seeing Dustie Waring (Between The Buried And Me), and Devin Townsend (Strapping Young Lad; The Devin Townsend Project), due to our awful time-management skills. I was pretty sad about this, pretty sad. I’m including a couple of pictures from last year (see slideshow below), just so I can feel a bit better about it. Mr P.R.S. and our very own Frank, NAMM 2015. Genevieve with Emil Werstler, in the PRS Room, NAMM 2015. Saying "hi" to Ronnie Radke. The man in the background makes this picture. NAMM 2015. Overall, it was a fun few days, spent wishing we were rich (or at least famous), surrounded by light-up instruments, sci-fi gadgets, and more neon colours than Design The Skyline could shake a guitar string at (if you need help with that awful reference, click here. Then proceed to looking the band up on Urban Dictionary.) Thank you, NAMM. Light-up drums by DrumLite, NAMM 2015. Lots and lots of neon, Charvel Guitars, NAMM 2015. Posted on February 19, 2015 by Genevieve Yu Wey and filed under SUM1.